Story | How bitsbeat Started? The three close friends-turned colleagues’ passion towards technology gave birth to Bitsbeat. 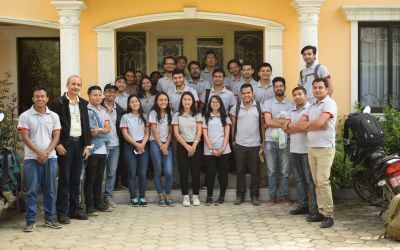 While working as software developers for one of the leading tech companies in Nepal we realized the limitless opportunities in technology and our combined capacity to ignite the tech revolution. The idea of initiating Bitsbeat was instantly born as we envisioned developing solutions to simplify lives, empower people and contribute to global economy by capitalizing emerging technologies. Our dedication, passion and hard work backed by risk-sharing ability led to the formation of a legal company. During the first six months of commencement, we were focused on developing Nodebeats, one of our featured products intended to serve the global tech community. We have always been concerned more about serving and giving back to the technology rather than business and profit-making. Therefore, we invested our technical knowledge and skills to develop Nodebeats and justify our passion, skills and commitment to serve the technology. We always have a belief that once you acquire practical skills and expertise in what you have learned in academics the business will just follow.